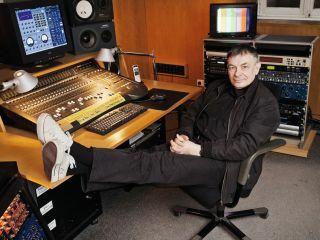 Never meet your heroes, or so the old maxim goes, but FM is delighted to report that our recent encounter with bona fide Electronic music legend Karl Bartos put paid to the notion that meeting one's heroes is inevitably doomed to end in disappointment. In the flesh, Bartos is a charming, erudite man with a philosophical take on Electronic music that reflects itself in the pristine synthesized contours of the music contained on his latest LP, Off The Record. From his time as a member of seminal German Electro Pop purveyors Kraftwerk, through his consequent Electrik Music project and collaborations with Bernard Sumner and Johnny Marr on their Electronic albums, Bartos has been a key figure in the synthesised music story. Off The Record, released in March, saw Bartos revisit his 'secret acoustic diary' of musical sketches and ideas built up during his Kraftwerk days and fashion them into an album that manages to simultaneously sound contemporary and timeless. With trademark vocoded vocals to the fore and his keen ear for a digital melody line still intact, we met with Bartos for a whistle-stop tour of the gear he employs to such stellar effect in his ergonomic Hamburg nerve centre. How did you set about the Herculean task of trawling through your digital media archive to begin creating Off The Record? "Well, I'm over it now but it was a hell of a job! There were tons of cassettes, 1/4" tapes and various other stuff. I moved my archive when we went from Düsseldorf to Hamburg and there was boxes and boxes of it and various rooms full of it along with old synthesizers. I always avoided going through the archive to put things in order until Gunther from Bureau B [Bartos' German record label] said, 'Karl, do you have any old recordings?' I refused initially but finally gave in... I'd always wanted to do it, and knew I had to, but it took me several weeks and the sound quality was rotten with many tapes broken. Eventually, I managed to get most of it into the computer. I saw that everything was dated 1977, 1978, etc, and I thought, 'That's a diary. An acoustic diary.' So I made it a concept. You do that kind of thing but usually just inside your brain - you refer to the things you've done before. It's the way we organise our brains. I also had to write about the concept and where the songs came from." "In the beginning, [Kraftwerk] only experienced rejection so it was really hard for us to battle against the wind"
Were you quite meticulous about correctly marking or naming ideas back in the days when you were building your archive? "You do what you do. I'd come up with a name, 'Neon Piano' or whatever, and I'd sometimes write the date. Sometimes not. Most cassettes had a name or a date on them. I also found a lot of stuff on Zip and Jaz drives but even some of those were damaged or didn't work. Between all the different media I pretty much managed to retrieve everything eventually, though." Were there a lot of nice surprises? "It was all such a surprise and funny to hear a song I'd done without a trace of emotion sitting beside something like Computer World [Kraftwerk, 1981]. It made me feel a little sentimental at times. Once I had them in order, it was easy for me to collate and collage them." Your first computer set-up was the IBM XT running Voyetra Plus sequencing software. That must have felt like going supersonic after using tape? "It was a real revelation. We were recording Electric Café [Kraftwerk, 1986] at Kling Klang [the band's private studio originally located in Düsseldorf, Germany], then we took it over to Right Track Studio in New York where François Kevorkian and Fred Maher introduced me to the Voyetra Plus software he had running on a laptop. I remember thinking, 'If Stravinsky had seen this machine he would have gone through the ceiling!' I found it incredible that you could put every instrument on the timeline like a score. I instantly knew that was going to be it." Did using the computer drastically reduce the hours spent programming and recording? "Yes, indeed. But there's always a flipside of the coin. It was a revelation but we couldn't foresee how every other year we'd then have to buy a new machine, which was ridiculous! It was hard enough to keep getting a new synth every couple of years as they were quite expensive. In the 1980s, everyone was transfixed by the idea of buying or upgrading new machinery. You were led to believe, 'This new machine will revolutionise your sound!' But it really didn't. Now we know it was actually a little bit of a dead end street. It ended up with the advent of the DX7, where I had two Atari computers with two different libraries and 48 different rimshots... What are you going to do with 48 different rimshots?!" You're talking to someone who traded in a Korg Mono/Poly and a Roland TR-606 to buy a Yamaha DX21 when they came out! "[Laughs] I had one of those, and the TX816 Rack. Today they sound like toys! If you switch on a Minimoog, though, it still has that sound." With MIDI celebrating its 30th birthday this year, how did it effect your workflow and is it still important to your studio modus operandi? "Absolutely. It's still very important as I run all my old machinery through MIDI. It's a nightmare, though, as I record the whole performance of a song. So if I have a melody line, I have two Minimoogs I'll address MIDI to then record simultaneously on stereo files. The Minimoogs sound wonderful. They're just the kind of 'out of tune' you want them to be. My trick is to then make a sample instrument from the stereo files. I usually record about 60 notes from the Minimoog and use the original Minimoog at the same time as the sampled one, which opens up a richness of sound. The melodic line on the track Nachtfahrt [taken from Off TheRecord] is four Minimoogs playing. They're MIDI'd and also the first oscillator is tuned." Back in your early Kraftwerk days, did you envisage music technology exploding the way it has? "From the time Florian had an engineer build a unit that synchronised our 16-step sequencers to a pre-production Roland 808 drum machine, we knew. There were two 16-step sequencers with little switches, with one row all kick-drum, that we hadonstage with us on the 1981 tour. It was predictable then how music would become a technological process but [American composer] John Cage wrote Credo in the 1940s so he really predicted it." Do you think programs like Ableton and Reason take something away from the process as well as making it much easier? "I met the guys who make Reason. They offered me a copy but I refused to take it. Not because I don't like it - it's a great program - but I don't needit. I have a piano, my computer and the way I compose is 'in the head'. I'm after melody and melodic lines. Sometimes I enjoy incorporating randomisation into compositions and I need software for that, but I open a time window for it. It's about the order of sounds and I don't want software telling me how I'm going to use sound." What software would you use for generating the random elements? "I used to use the ARP sequencer but now there's apage in Logic's ES2 where I can pre-program algorithms to change a sequence. You can randomise the amount of tonal pitch changes, then alter it and compose over what it gives you." "No program is telling me what I'm supposed to do. I didn't start out with Ableton Live, I started out with the idea of music"
Would you talk us through the process of building a track, like Musica Ex Machina off the new album? "That was an improvisation. I had drum sounds sampled from John Bonham [Led Zeppelin] playing on an off-beat. If you have one line of off-beats, two bars, you try to make a complimentary rhythm to it. So, like in counter- point,you put it in the gaps. I got the complimentary riff going then the beat changed because I opened up another MIDI channel, copied the line and allowed the machine to randomly change it. So, the machine composed but I get the copyrights! [Laughs]"
Does electric music work best when 'less is more'? "I have this idea of pictogram sound. When I was young and studying music, like most music students of the time I was into Jazz. My professor once said to me, 'Why are they playing so many different notes? They're searching for the right note.' So I have nothing against improvisation but I'm more into defining what note I want to have. That's why I've always been keen on visual pictograms, like traffic-signs as its pure information. If you can find a chord progression and a pure, authentic melody it's all you need. The most important information is definite pitch because it's the purest information our brain can remember. That's why everyone can remember so many different melodies. Do you think melody has become an overlooked part of some Electronic music? "That's what I dislike about this development of computer technology as it's now all about the programming. I can cut and paste, change tonality, time-stretch things, use this or that plug-in, but where is the music itself? People don't tend to remember programs or production, they remember melodies. One melody from Mozart... What instrument? Doesn't matter!" What synths have you held onto from your Kraftwerk days? "What I have in the studio isn't all of my synths. I've sold some over the years but have kept most of the synths I've owned. I never really felt the need to buy any big modular system. It would have been nice to have but all the maintenance was really expensive at the time. Still is.I had a little envy for people like Tangerine Dream with big walls full of modulars. But I've always tended to be happy with the sound I have- I don't need ten million sounds. I'm happy if I can tell little stories with a Moog melody line. So the Minimoog, ARP Odyssey and the Polymoog became my signature. The ARP still works fine. It's great if I need to create a strange electronic sound." As wonderful as synths like the ARP Odyssey are, it must have been incredible for live shows when the first programmable synths started appearing? "We never used programmable synths for the live shows. We had the Minimoog, the ARP, and Florian had a Prophet V with a sequencer while I played a Korg PS-3100. I played the bass parts and had to change sound during songs but it was okay." "I'm using vocoder but speech synthesis at the same time. They meld well together and sometimes I sing phonemes along with it to give them more definition. You don't hear it but it's in there to support certain phonemes. I bought the VirSyn Matrix and it's perfect. I use all the other vocoders, like the Roland VP-330 and some others, but the Matrix is just so simple and easy to get a good sound that you can't beat it." What microphones do you use for handling your vocal duties prior to the vocoding? "I've always used the Neumann U87 for vocals. Sometimes I'll record feedback in an analogue delay, for example, and I'll use the Sennheiser 421." We noticed you have three screens set up in your studio. How are they employed in your workflow? "I work a lot with Final Cut Pro and you need big screens for that. I usually have the components and timeline on the middle screen, the product on the right-hand side, and the plug-ins for any project on the left screen. It means I don't have to change things around so much, but the main reason I havethree monitors is that, onstage, I have this visual triptychon. You have to prepare for that so it's easier if you have one computer system running on three screens, upon which you can run the Quicktime movies.What I'm really after is a new show where there's a sort of visual counterpoint. So now I can tell a different story on each screen, which I find very beautiful. With Nachtfhart we have someone driving through the night in a thunderstorm while on another screen you can watch the car wheelsand on the last screen see his final destination. It just gives a whole different perspective to things." Do you compose with a visual in mind or to a specific piece of footage? "Sometimes. With the visuals for Herr Karl, I had a different concept. I wanted to make the video of him just wearing his red shirt but it was too boring so I had the idea that he ended up working as part of the Tour de France team, having a telephone call and, in the middle section, he even speaks to me. He's so serious and still can't move so I got the feeling he believes what he's actually saying. He's part of this ongoing technological developmenteven though he hasn't improved or upgraded. That concept influenced the song and it's good to tell the story on paper, in a film and via music. They support each other; make it richer." It sounds like you have an ergonomic approach to music-making. Do you think the German mindset is ideally suited to Electronica? "Maybe. I'm not a technician, though. The digital recording environment has changed because of digital feedback. I like my digital set-up now and when I record anything into the computer I have a system of total recall. The desk, the computer and my TC Electronic Finaliser. That's how we mastered this record; we didn't change the final recording. We'd take a mix out in the car and drive aroundHamburg, then come back and the total recall allowed us to tweak anything that needed it." It's nice to see a proper mixing desk at the epicentre of your studio set-up. Is that still an integral part of your music-making process? "I do my work on the computer, then I turn around to the mixing console, then use the most important instrument in my studio: the sofa. I let the machinery run, watch TV with the sound down and live with the music I've made. I find out the right tempo this way and I'm into the rhythm of the music. I don't mean the drum beat, rather the rhythm of how all the individual instruments compliment each other. I like watching the timeline in Logic to see the rests and how the movement of the bass compliments the drums and vice versa. I can watch how well the rhythm of the vocals is merging with the rhythm of the music. "You have to be a consumer of your own music. My music-making process hasn't changed much over the years. I have a computer now but I still have to evaluate the quality of the rhythm by listening. I don't use the mixing console a great deal but I use it as output with groups of instruments coming through it: bass drum, snare, percussion, effects, bass, leads, melodies. On the other computer input are the live instruments, such as the Minimoog, and this way I never have to change my set-up. If I want to record the Minimoog, I set it up next to the desk and record - it's all connected. Once it's in the computer, I put the Minimoog out of the studio as its distracting." Is there anything you miss about the old methods of sequencing or mixing a track? "In the old days, we had to mix with eight arms! Each of us had two faders to remember to raise or lower but it worked. I don't miss anything about it, though. I'm using technology the way I want it to be. No program is telling me what I'm supposed to do. I didn't start out with Ableton Live, I started out with the idea of music. I use my studio as a place where everything is the way I want it. I need the mixing console for the distance of using a fader. Using a mouse or a digital fader doesn't give me that same perspective. I want to see the sub groups. I sit at the computer and address my composition and the way I work to the sub groups." We couldn't help casting an envious eye over your Roland MC-202 during our earlier studio tour. Did you enjoy the mathematics of programming those? "No! They were crap to program. The SH-101 was great and, like the Minimoog, really instant. The sound of the MC-202 is great, so if you have the time to program you will always get good results." Again, it's nice to see some 19" racks full of outboard. What's the most important gear in there? "It's a small rack but I still have the DAT and cassette machines rack-mounted because of this record. They're not usually there but I had to get in touch with my past! Normally there's a Sony F1 digital recorder sitting in the space where they are. The rack is basically my vocal station, so I have everything wired in from my live room through a Tube-Tech PB-1B EQ. I have three Tube-Techs so we sometimes have three different bass synths going through them and a BSS DPR-402 compressor just to warm everything up. "I also have four Rebis Filter Gates that are good because you can decrease the amount of bass. And, of course, the Klark DN60 Real Time AudioAnalyser lets you see exactly where you want to twist the bass frequencies. So sometimes we'll have an analogue bass coming in through the compressor and a BSS EQ through the desk, maybe even through another EQ too. It sounds great. You can't get that sound with a plug-in. I love plug-ins because they're so easy to use but personally I just can't get that punch from them." That said, you do find yourself using the GForce M-Tron Pro plug-in at various times. "Absolutely. I also have a lot of Mellotron sounds that I recorded a long time ago, and I like to mix the two. They don't loop so often I have to record them again and get them looping. The GForce software version is fantastic. So I do love plug-ins if they work." "In Kraftwerk we were fascinated by the idea of making something like an acoustic animation film where everything is completely artificial. Even people like Stockhausen and the Music Concret movement were fascinated by sound recorded via a microphone, which was then twisted by a magnetophon as well as music generated from a sine-wave generator. The idea of using electronic drums was a derivation of that idea. I fell in lovewith the corny sound of early drum machines. It's not a perfect rhythm and the loops they created weren't particularly good but they had a [American composer] Steve Reich quality, going slightly out of phase. So you had a drum machine and it could stay on for as long as you paid your electricity bill. "I was quite a good drummer but I also loved listening to the machines. Early drum machines were a little absurd and looked quite odd in their little boxes. We wanted to change the rhythm and had the idea to disconnect the trigger and put it on a beater. By beating the percussion multi-plate we were completing the circuit and creating the sound. Florian had some technicians build a machine to his design that allowed us to create our own rhythms with these artificial sounds." Was there a certain enjoyment within Kraftwerk regarding all the myths surrounding you, such as having no phone in Kling Klang? "That was true. In the beginning, though, we only experienced rejection so it was really hard for us to battle against the wind. It were as if we were the only ones doing what were doing at that time."